2015 annual report infographic. Click to enlarge. 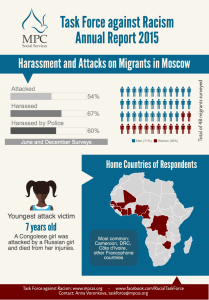 MOSCOW – Moscow Protestant Chaplaincy’s (MPC) Task Force Against Racism has documented reports of attacks and harassment among the African community during the first half of 2016. Through interviews with 42 people of color, the Task Force documented 20 incidents of harassment, 12 incidents of harassment by police, and 7 racially motivated attacks. The Task Force collects its information at MPC’s Parish Center, a safe haven for people of color in Moscow. We will continue to publish reports in English and Russian on an annual and bi-annual basis. Click here to view the first Biannual Task Force Report for 2016. Нажмите здесь чтобы посмотреть доклад на русском языке. 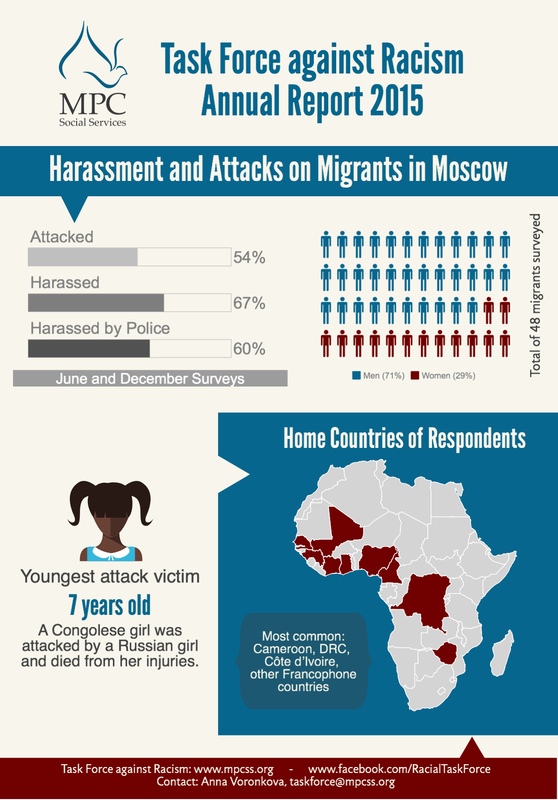 Click here/Нажмите здесь to view the 2015 Annual Task Force Report or infographic. Click here/Нажмите здесь to view the second Biannual Task Force Report for 2015. Click here/Нажмите здесь to view the first Biannual Task Force Report for 2015. Click here/Нажмите здесь to view the 2014 Annual Task Force Report. Click here/Нажмите здесь to view the second Biannual Task Force Report for 2014. Click here/Нажмите здесь to view the first Biannual Task Force Report for 2014. Click here/Нажмите здесь to view the 2013 Annual Task Force Report. Click here/Нажмите здесь to view the second Biannual Task Force Report for 2013. Click here/Нажмите здесь to view the first Biannual Task Force Report for 2013. Click here/Нажмите здесь to view the 2012 Annual Task Force Report.